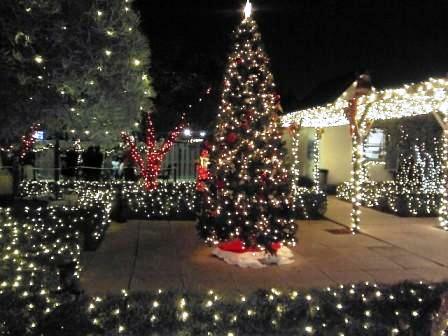 To the delight of so many locals, the South Florida winter season brings great weather to enjoy the many Christmas events in local communities. 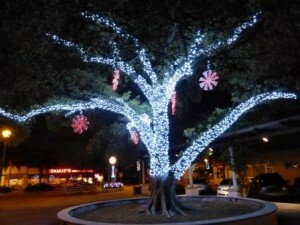 Here in West Palm Beach area, you can find many public places to welcome the Holiday Season. Attending a Christmas Tree Lighting is usually one of the most memorable with twinking lights, gorgeous displays and many with musical performances. 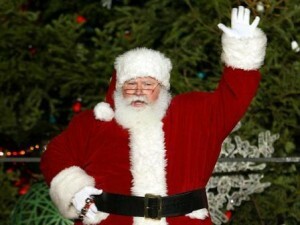 The arrival of Santa Claus always brings excitement and joy to everyone. Whether you experience the beauty and nostalgia of times gone by or start a brand new tradition with your family, make plans to visit one or several events to welcome the 2017 Holiday Season. Enjoy the music, lights and cheerful atmosphere of the holiday season. Come be part of the festivities as CityPlace is transformed for the annual lighting of the 40-foot Christmas tree beautifully decorated with more than 10,000 lights and 2,000 poinsiettas. Enjoy live entertainment by Wonderama from 7pm to 11pm. Experience nightly snowfalls. 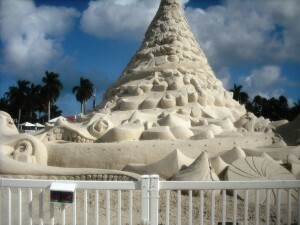 Florida residents and visitors alike can look forward to a memorable snowfall experience done south Florida style. 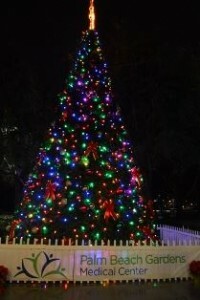 Every year, thousands of visitors look forward to this uniquely South Florida tropical-theme display featuring Sandi, the world’s only 35-foot Christmas tree. Made of 600 tons of sand, sculpted and decorated with over 5000 lights, Sandi is back with a brand new addition to her family. The lighting kicks off the month-long Sandi Land celebration. 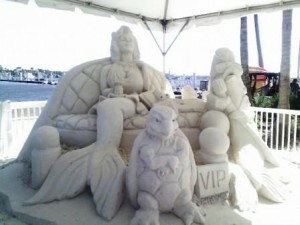 Guests can see four 25-ton sand sculptures surrounding Sandi the tree, play a round of nine-hole Peppermint Putt-putt mini golf, and create their own Florida-style snowmen. Sandi will also assist in the adoption of furry friends from several local rescue organizations. 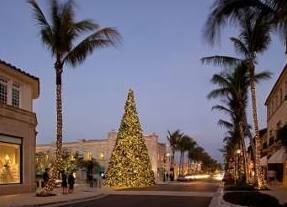 Light shows will repeat nightly on the quarter hour, from 6:30 p.m. to 10:00 p.m., through Jan. 1, 2018 in West Palm Beach, Florida. Open nightly 6pm to 10pm including including Thanksgiving, Christmas Eve, Christmas Day, New Year’s Eve and New Year’s Day. 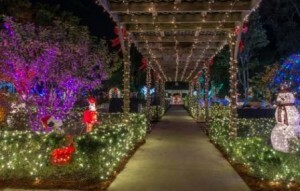 Tradewinds Park is once again a fantasy of color, lights and design this holiday season. 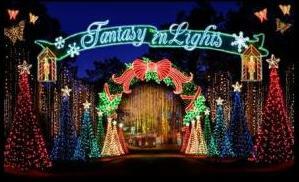 Visible from the Florida Turnpike, The Holiday Fantasy of Lights, Broward County’s spectacular drive-thru holiday lighting event is returning to Coconut Creek for 2017. The 22nd edition of the Holiday Fantasy of Lights, with 3 miles of giant animated holiday displays and illuminated trees, is larger than ever blending the favorites of the past and the excitement of new creations by Brandano Displays. Extremely popular, attracting crowds over 150,000 visitors of all ages in 35,000 cars, trucks, motor homes and buses. The Holiday Fantasy of Lights presents exciting sponsorship and marketing opportunities for regional businesses that can show their public appreciation by bringing this exciting holiday event back to South Florida. Exciting addition of a 2,400 sq. ft. ice skating rink will be located in the front of the building made with real ice and kept at 32 degrees. The Panthers in Palm Beach Ice Skating Rink will be available from 3pm to 10pm Mon. to Fri. and noon to 10pm Saturday and Sunday. Ice skating tickets are $15 each for general admission; $13 per person for groups of 10 or more; and $10 per person for military veterans and first responders; for a 60 minute skate session. The cost includes skate rental. Walk through the garden and enjoy all the brilliant lights surrounding you. Delightful exhibit kids will love with a spectacular manger scene, a 6-foot lighted Hanukkah Menorah, animated holiday displays including a beautiful gazebo, cascading fountains, renovated pond, and an arctic zone with lighted polar bears and penguins. A 14-foot Christmas Tree stands in front of the store where you can stop in for delicious chocolates and heavenly treats. Santa Claus and Mrs. Claus arrive every Friday, Saturday and Sunday at 6 p.m.
will hold its lighting ceremony with festivities including Santa Claus, piano and organ performances, holiday caroling in the courtyard, with the Christmas Tree lighting at 4:55 pm. Whitehall’s first floor is decorated in traditional Gilded Age splendor for the month of December each year. 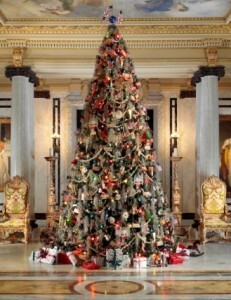 The focal point is a 16-foot tall Christmas Tree in the Grand Hall, adorned with colored electrical lights and traditional Gilded Age style ornaments. Bring your family and experience holiday traditions like the Annual Tree Lighting where you can meet Santa Claus, enjoy refreshments, hear music on the historic organ and watch as Henry Flagler’s youngest descendants light the Grand Hall Christmas Tree. During Holiday Evening Tours, families tour Whitehall after hours by the glow of the original light fixtures, and learn the origins of American Christmas traditions. Holiday 2017 celebrates the season Saturday, December 2nd at 5:30 pm as this tradition continues for the 47th year to provide a magical experience for the entire family. 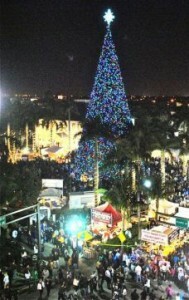 The tree lighting ceremony of Boynton’s 50-foot Christmas tree will light up at 6:30 pm followed by a concert. Holiday photo op with Santa, children activities, holiday vendors for gifts and food & beverage vendors will be available. 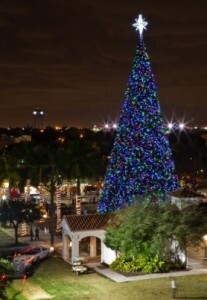 Come celebrate as Lake Worth is scheduled to host its annual Holiday Tree Lighting Ceremony from 6 to 10 pm at the Cultural Plaza. There will be caroling, performances by Downtown Dance, photos with Santa, face painting, food and much more. More than 5,000 spectators line the downtown streets of Lake Worth, for the city’s annual holiday parade. Featuring floats, antique cars, marching bands, twirlers and other performance groups, the annual event promises plenty of family friendly fun. A special visit from Santa and Mrs. Claus! Food, drinks and snacks are available for purchase. Led by Santa Clause, his elves, and entertainers, The Worth Avenue Association and Palm Beach Mayor, Gail Coniglio, welcome the holiday season with an annual parade that concludes with the signature, spectacular Christmas Tree Lighting Event, signifying the unofficial start of Palm Beach’s magical shopping season. The parade begins at 6pm, Santa and the elves will lead the parade and The Cardinal Newman Marching Band will lead the way for Santa, who will ride down the Avenue in a yacht. 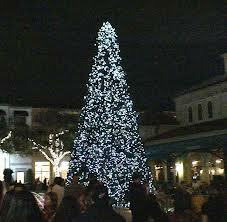 The parade will end with the flip of the switch that lights the magnificent 40-foot tree at 6:29pm. Make sure to get there early and queue up the little tykes for a turn on Santa’s magical throne.